Tis the season for busy days, right?! Surprisingly, our December is looking pretty relaxing and quiet. Thank you, Jesus! 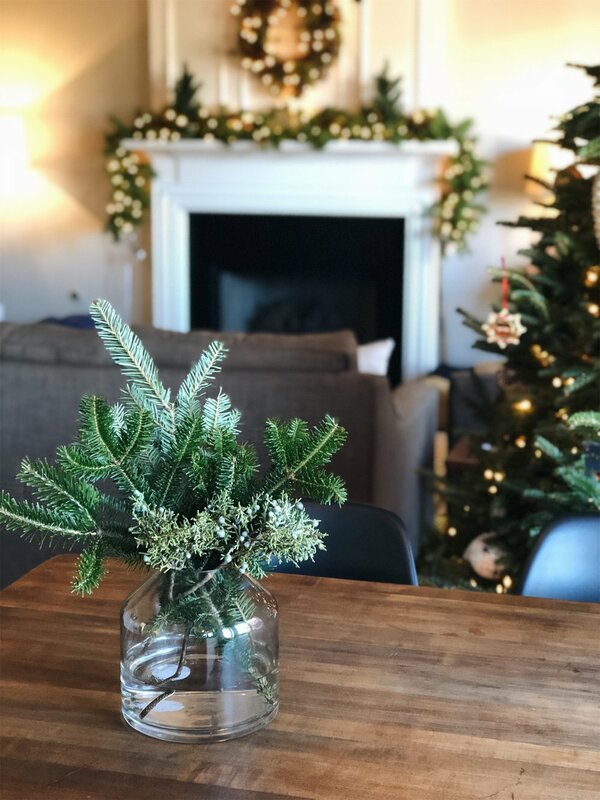 I want to show you a few photos of how I’ve been decorating for Christmas around here. It’s not done yet as I seem to tweak something just about on a daily basis. Trying to live out “less is more” and not go overboard, which I am prone to doing. I have tried to stick to as much fresh greenery as I can and forage little clippings from the yard to tuck in here and there for texture and color variation. Starting with the outside of the house, I hung wreaths of the front door as well as on the fence gates. I’m considering making a couple bows for the fence wreaths… what do you think?? 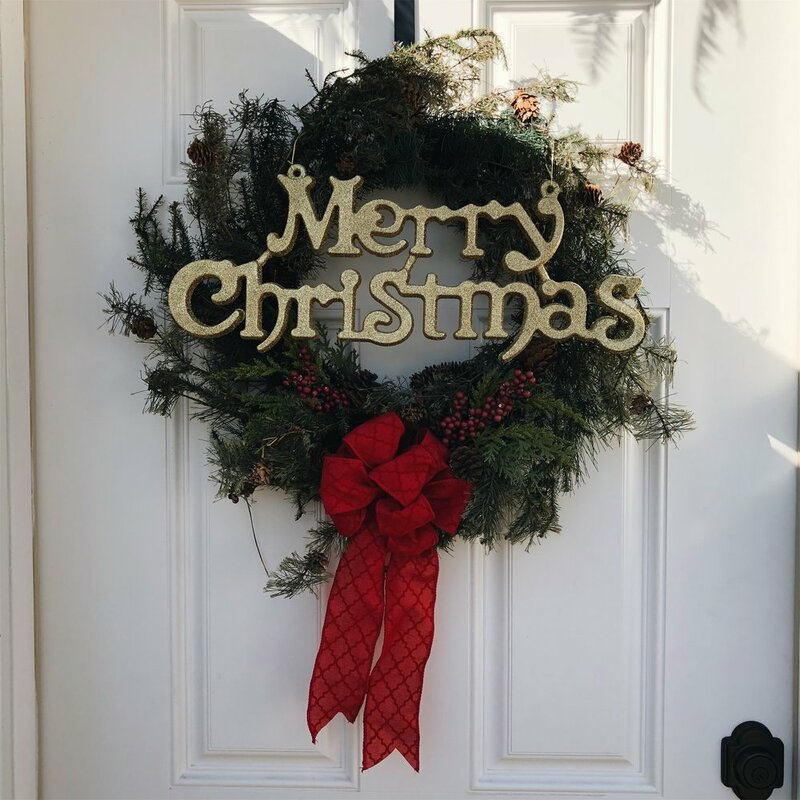 This year, I bought a fresh pine and cedar garland from Lowes and draped it over our front door - it looks so soft and festive!! You really can’t beat real greenery this time of year! As you walk in the front door, you will see some garland running up the banister. I found these pretty, yet plain, faux garland (on sale for $10 each!) at Hobby Lobby and embellished them with fresh cedar and magnolia cuttings from the yard (I used zip-ties). Then, I tied ivory satin ribbon bowes that droop ever so lovely. Reminds me of the ribbon I had on my wedding bouquet. We found a gorgeous tree at our local Lowes store and she is a beaut! In general, I make a conscious effort not to collect nick-nacks and things that create unnecessary clutter around the house. However, I do like to collect tree ornaments year to year. My Aunt Carol (not blood related but may as well be 💕) has always had what she calls a Travel Tree in her home and I love the tradition. So, whenever John and I travel somewhere together, especially somewhere new, I buy an ornament that reminds me of our travels. This year, I have added ornaments from Mt. Rainier and Hunting Island, SC. It’s fun for us to remember the places we have been together as we decorate our Christmas Tree every year. What are some of your favorite family traditions this time of year? Do you visit family or stay home? Or go on vacation somewhere wonderful? I’d love to hear about it!